Stems long-creeping, 0.7--3 mm diam. ; scales uniformly brown, ovate-lanceolate, straight to slightly contorted, loosely appressed, often deciduous on older portions of stem. Leaves scattered, 7--30 cm; vernation noncircinate. Petiole usually dark brown, rounded adaxially. 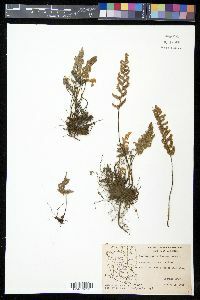 Blade oblong-lanceolate to ovate-deltate, 4-pinnate at base, 2--5 cm wide; rachis rounded adaxially, with scattered linear-lanceolate scales and sparse monomorphic pubescence. Pinnae not articulate, dark color of stalk continuing into pinna base, basal pair not conspicuously larger than adjacent pair, usually equilateral, appearing densely tomentose adaxially. Costae green adaxially for most of length; abaxial scales multiseriate, lanceolate-ovate, truncate to cordate at base, usually without overlapping basal lobes, conspicuous, the largest 0.4--1 mm wide, strongly imbricate, often concealing ultimate segments, long-ciliate throughout, cilia fine, curly, forming entangled mass. Ultimate segments round to slightly oblong, beadlike, the largest 0.7--1 mm, abaxially nearly glabrous, often with a few small scales or branched hairs, adaxially appearing tomentose but actually nearly glabrous. False indusia marginal, weakly differentiated, 0.05--0.25 mm wide. Sori ± continuous around segment margins. Sporangia containing 32 spores. n = 2 n = 90, apogamous. Sporulating summer--fall. Rocky slopes and ledges; on a variety of acidic to mildly basic substrates; 200--2500 m; Ariz., N.Mex., Tex. ; Mexico. Cheilanthes lindheimeri is an apogamous triploid of unknown parentage. 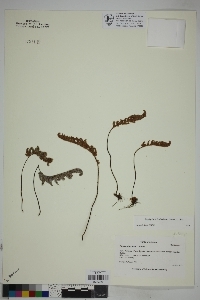 It is occasionally misidentified as C . wootonii (actually the element here recognized as C . yavapensis ); most specimens can be placed using the characteristics given in the key. The adaxial blade surface appears to be densely gray tomentose, but this is an illusion created by the fine, curly cilia of the abaxial costal scales that overtop the minute ultimate segments and form an entangled mass that prevents the easy removal of individual costal scales.